Happy St. Patrick's Day, dear readers! It's actually not a big day for P and me 'cause it's a bit like St. Paddy's Day every day around here (lol can you guess what P stands for now? =p). The joke started a few years ago when we went shopping at Old Navy close to a certain holiday. A cute green St. Patrick's Day tee was on sale, so I got it for him with the justification that he could wear it any day rather than just the one and he totally does wear it all the time (yay!). But then again, I just asked if he'd wear it later today, and all I got was a huge eye roll. Don't worry though, I'll keep working on this...I've still a few hours yet. 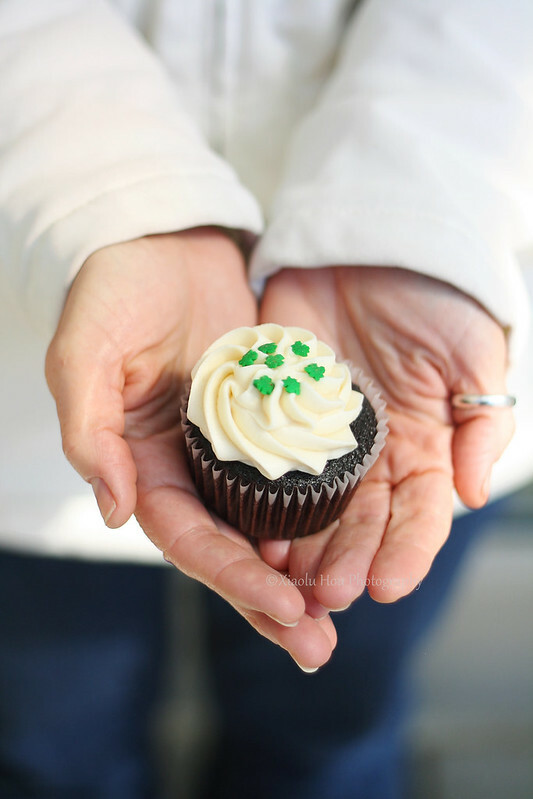 In the meantime, I want to share a really delicious Irish-themed (by which I mean boozy ^-^) cupcake recipe with you. I have my coworker and friend A to thank for requesting these chocolate cupcakes full o' Guinness stout and Baileys Irish cream. Her repeated guidance as I prepared to make these was "Remember. There is no such thing as too much Baileys!" I agree in theory, but many of you bakers will already know that runny frosting is a bit of a nightmare. I found a happy medium using my special cold cream cheese technique to keep the frosting firm while adding more liquid than usual. The Boy called these "seriously dangerous" and a combination of "F yea and awesome!" Guinea pig coworker N may have moaned a little while eating his cupcake. Coworker B called these the "best thing ever!" Coworker C, who works in Pricing, when asked if the cake was moist enough drew me a bell curve showing me that on a scale of 1 to 100 (completely dry to terribly moist) with 50 being the ideal level of moistness these cupcakes were a 48. On a side note, I'm a crazy perfectionist so I tweaked the cake recipe in response to his feedback. Hopefully the recipe below makes a perfectly moist 50-worthy cupcake now. Coworker N liked the cupcake and was kind enough to be my hand model for the photo above (thanks!!). Now if those reactions don't get you running to the kitchen, I don't know what will! I truly do hope you'll give these a shot. Either way, hope you all have a fantastic (and safe) St. Patrick's Day! XIAOLU'S NOTES: Unfortunately, my cold cream cheese technique for making this frosting really requires the power of a stand mixer. If you only have a hand mixer, I'd recommend omitting the cream cheese from the frosting and increasing the amount of butter to 1 3/4 cups. I didn't think of this until it was too late, but a ganache filling would be a great addition to these cupcakes. For example, this one over on Annie's Eats sounds fantastic. Preheat oven to 350 degrees F. Grease the top of two or three standard 12-cup muffin pans (I use 2 pans and 3 standalone paper baking cups). Line pans with 27 baking liners. Bring stout and butter to a simmer in heavy saucepan over medium heat. Add sifted cocoa powder and whisk until mixture is smooth. Let cool at least 8 minutes. Whisk flour, sugar, baking soda, and salt in large bowl to blend. In a measuring cup, whish the eggs, sour cream, and vanilla together well. Add the stout-butter mixture to the dry ingredients, and immediately whisk just until the batter is mostly smooth (no more than 1 minutes and small lumps are fine). Next, add the egg mixture and mix just until evenly incorporated. Distribute batter evenly among baking cups, filling each about 2/3 full. When finished, slam the pan evenly and firmly downward from 2 inches above the counter to force out any large bubbles. Bake for 16 to 20 minutes, or until a toothpick inserted into the center of a cupcake comes out clean. Remove from oven right away, let cool for 5 minutes, then transfer cupcakes to a wire rack to finish cooling. Once cupcakes have cooled completely, pipe or spread on frosting. Enjoy! Sift powdered sugar into a small bowl. Using a stand mixer, cream the butter, and 1 1/2 cups of the powdered sugar until thoroughly blended and fluffy. Add another cup of powdered sugar along with 3 tablespoons of Irish cream, then mix again until evenly incorporated. Add the remaining powdered sugar, the rest of the Irish cream, and the vanilla. Mix until evenly incorporated. Now turn the stand mixer to medium high speed (about 6), then add the COLD cream cheese, a chunk at a time, waiting at least 5 seconds after each addition so the mixer has time to incorporate it. Finally, turn the mixer up to high speed and beat for 1 minute until smooth. But be careful to avoid overbeating or the cream cheese may start to break down and become gloppy. Keep in a cool location and try to use within 30 minutes since the frosting will begin to soften as the cream cheese warms up. WIth all these rave reviews, I definitely need to make these! P is so funny about the t-shirt. :P Cute! I LOVE that frosting!! YUM! I am going to try it this weekend, thanks! Excellent -- please let me know how it goes! Alcohol as topping! Wow what a intelligent innovation! I didnot think of this combo!